VanBaelenGuillot: Out of the mountains, into Brazil! Out of the mountains, into Brazil! Currently we are in Argentina after having spend a great time in Brazil. In the short time we had to visit parts of the country we really have been pleasantly surprised. Not so much because Brazil is one of the most beautiful countries of our trip - our trip has brought us through pretty normal plain areas - but because of the extreme friendliness and openness of the people. Not speaking a work of Portuguese we have always been able to communicate with people, as they are very keen to understand and be understood. So everything started after our long dirt road drive in Bolivia, heading to the boarder of Brazil and the Pantanal - as explained in our previous blog the Pantanal is an area the size of France and has the highest concentration of animals in the Americas. After driving 500 km on Bolivian dirtroads Brazil welcomed us with a perfectly asphalted road - which is strange as only 15 cars pass this boarder on a day. Even funnier, when entering Brazil we could not complete our regular immigration and customs check as there was nothing installed, everything had to be done in the next village, Caraces, 100 km further! We can tell you, it is a pretty strange procedure! After arranging our paperwork - which by the way is not required for a car in Brazil, again strange but okay - we headed to Pocone, the entry point for the Pantanal. Here we were immediately made aware that we found ourselves in Brazil as everything was coloured green and yellow. In the morning we wake up super early to go to the Pantanal, hoping to arrive before the birds wake up. The area turned out to be amazingly beautiful and filled with birds and caymans (estimated to be with over 30 million in the area). We met some Belgians here which even saw a jaguar walking next to their car! Our mammal experience was limited to seeing lots of Capybara, the worlds largest rodents at 70 kg. No jaguars for us! On top, our stay was also reduced as Alex got a serious gastroenteritis and we had to return to the village to get him connected to some antibiotics. From there our 'race' towards Rio continued. As you might remember we had some tickets for Belgium - Russia and we had over 3.000 km to drive and several stops in the middle. So after being helped very well in the hospital (for free!) we headed towards Brasilia, the out of nothing created capital constructed over 50 years ago. A quick stop in our first Brazilian colonial town Pirenopolis was a great change of what we have seen so far. The Portuguese colonial clearly had a very different style to the Spanish, building lower and compacter, cuter. At the city of Brasilia we received one of our first big Brazilian surprises. At the JK monument - he? who is JK? Well he's the president who realised the concept of Brasilia, a centrally located capital for Brazil - we got addressed by Rogerio (Sr) and Rogerio (Jr), who got interested by the number plates. After chatting a bit they offered to show us around the city. It turned out to be a great experience, as they are both passionated about the place and very knowledgeable. The city is very well planned and all government buildings have been designed by Oscar Niemeyer, Brazil's most famous architect. The place turned out to be a complete surprise and a true recommendation to everyone visiting the country. Happily surprised we continued our journey direction Rio which brought us to the next colonial village of Diamantina, which again turned out to be a colonial pearl within the same style. A couple of hours from here is Belo Horizonte, where the Belgians would play their first world cup match. We didn't have tickets, but decided to watch the match at the Fifa Fan fest, a large place installed in large cities where people join to watch the matches. Obviously, Alex was the only Belgian here, therefor being popular for radio interviews - in Portuguese! Talking about the world cup, we were generally very surprised to see that the Brazilians are not really as big the football fan that we thought they would be. They are always very supportive when Brazil plays, but otherwise they don't really obsessively follow it like we sometimes see in Europe. There have been numerous matches that we have watched all alone in bars together with the bartender. Anyhow, back to the travel, we cannot say much about Belo Horizonte, the city was very busy and was not inviting for a touristic tour - although the centre didn't look unpleasant. Rio was approaching - luckily as the matchday was approaching as well - and we decided on an in-between-stops to break the journey to the Cidade Maravilhosa. Tiradentes was the victim, which we will remember for the many dogs which were following us. From there we went towards Rio where we arrived on the day that Spain was playing against Chile - at Maracana. It turned out to be a bad idea, as everyone in Rio got half a day of holiday because there was a match played in the city. The originally already not moving traffic of Rio stopped to move at all and we took hours to get to hour destination, the house of Randolpho and Diana, who were our incredible hosts here in our first coachsurfing experience. Having a place to stay allowed us to cook all the stuff we missed during the last months, like lasagna! Also, as everybody know Spain lost for the second time...and we had the 'awesome' experience to hear the Chilenos sing: Chi Chi Chi Le Le Le...Viva Chile and more other songs! Apart from enjoying the match Belgium Russia, we have also really enjoyed the city - not including the traffic or transportation in general. We met our travels friends Mattieu and Nico, who were waiting in Rio for over two weeks to ship their car to Senegal. Once they left, we hit the city and it's surroundings, including the national parc of Tijuca, one of the world's largest urban forests, which houses the corcovaro ( this giant Jesus), the pao de acucar, the botanical garden, Niteroi region and the beaches. To much to list it all, as Rio really has a lot to offer for one city, although it is a bit more hard to enjoy it with the world cup. After spending a good week here, it became time for us to continue, unfortunately as this city is one of the most beautifully located city from a geography point of view and there is enough to do to keep you two weeks occupied. Next time you book a city trip to New York for the third time, change your mind and just go to Rio for a while, you'll enjoy it more. Our time is becoming more and more limited and we still have so much we want to see and do. First we shortly head up north of Rio to visit the beaches of Cabo Frio and Arraial do Cabo, where we trained our diving skills in the chilly waters. Pretty good diving spot as we saw turtles, several moray eels, a seahorse, another type of snake and many other fishies. On top we received the Padi confirmation that divers are more fun and that scuba is spelled S C U B A - diver jokes, for those wondering. Heading south we pass Rio again, where we opted to check out the Sambadromo, where they had installed a free camping as Rio got flooded by campers from Chile and Argentina. It turned out to be a cool place to meet many travellers who, mostly, are here for living the worldcup. It was crazy to see how many people really do lots of efforts to see their team play! 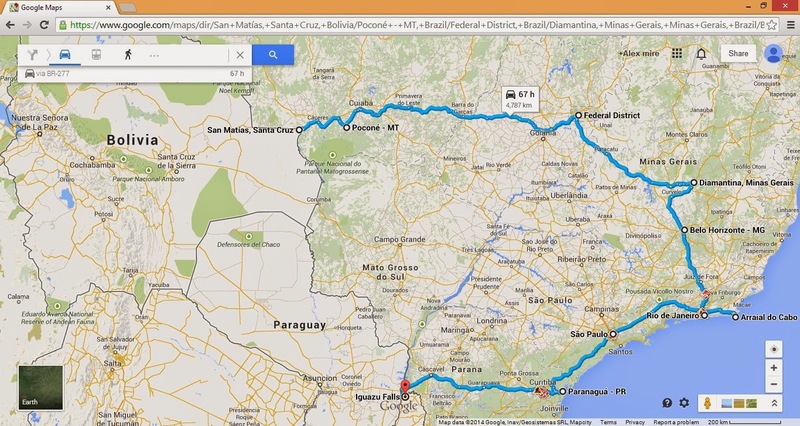 The next day we go direction Sao Paulo where we were gonna meet Ruben and Sarah. The coastal route from Rio takes us hours to leave the city - but brings us past a Decathlon to buy some much needed gear!! - but afterwards rewards us with great ocean views filled with small islands. As the distance was big we stop in Paraty, a coastal colonial town with nice beaches and definite must visit stopover between the two colossal cities. We arrive in Sao Paulo when Brasil is playing against Chile, which was excellent as it meant that we had the road for our own and we didn't get stuck at all in traffic. We were just on time to see the penalties and to see the Brazilians go crazy about the victory. We were very lucky to have been hosted by Ruben and Sarah in their gorgeous place and to join them with a well deserved paella! Thanks Ruben, it was delicious! As Sao Paulo doesn't have much to offer the tourist we decided to leave it for what is was and to go to our last coastal stop. Nearby Curitiba we found a campingspot to relax for some evenings before crossing the country to the west where we would visit two 'wonders'. Our first wonder to visit was the Itaipu dam, the most power generating hydroelectric plant in the world. The place is pretty impressive and the tour we followed allowed us to enter the dam and see the turbines, the control centre and the giant watertubes. It is not cheap but very impressive. And from this ingeneering wonder we went to a natural wonder, the Iguacu falls. The waterfalls can be visited from both Brazil as Argentina and both are worth it. The Brazilian visit provides you with a panoramic view of the falls - which are several kilometres long. The place is really nice and although we have seen a lot of waterfalls along our trip, including the Niagara falls at the beginning of our trip, we were very impressed with the scale of the place. Even if the flow of the individual waterfalls is not enormous the simple quantity is impressive: during the dry season there are around 150 falls and this increases to 250 during the wet season. We really enjoyed our tour of Brazil and have continuously been surprised about the kindness of the people, but realise that the place has so much more to offer - it is about the size of the USofA and culturally and geographically has a great diversity. We wished we would have more time to explore it, but we believe it is a bit of a Mexico case, where you need at least three months to see the different aspects of the country. In addition, we found that Brazil is definitely a very developed country, although this changes fast when you leave a big city. And on top, although they are probably the better drivers of the continent, the completely lack the ability to read traffic, making it pretty exciting to drive, we have seen more than one large accident happen in front of our nose - something which we have not seen anywhere else during our travel. But don't let this worry you, if you have some months, take some time off and visit it! The place is filled with caymans - over 30 million! Our excellent and super nice 'city guides': Rogerio and Rogerio - Thanks so much for showing us the best in town! Finally Diana couls relax - she just finished here thesis/monograph! Thanks a million Randolpho and Diana! Next stop are the beaches of Arraial do Cabo - chilly willy! The red thing is a seahorse! Hi Ruben and Sarah, thanks again for everything and the amazing paella! The place is great and we are already looking forward to visiting the Argentinean side, although it's only accessible for half due to the recent rains! Ja us queda poc. Disfruteu molt i amb ganes que vingueu ja.